What Makes Serious Games Effective? New Research-Based White Paper Published on Serious Learning Games Game On! Learning, the thought leader in serious learning games for the corporate learning market, has just published a new white paper on serious learning games for the corporate training market called “What Makes Serious Games Effective? 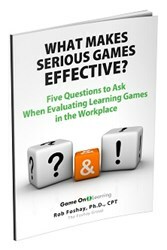 — 5 Questions to Ask When Evaluating Serious Games in the Workplace”. Share on TwitterShare on FacebookShare on Google+Share on LinkedInEmail a friend Serious Learning Games White Paper Research on serious games suggests improved job skills can be a result of integrating a serious game into your training program. But the same research shows that effective serious games are difficult to design, and they are rare. Gainesville, Florida (PRWEB) December 17, 2013 Game On! Learning, the thought leader in serious learning games for the corporate learning market, has just published a new white paper on serious learning games for the corporate training market called “What Makes Serious Games Effective? — 5 Questions to Ask When Evaluating Serious Games in the Workplace”. The white paper is authored by Dr. Rob Foshay, a principal of The Foshay Group, a consulting firm specializing in high-value strategies for e-learning product architectures, training, and certification. He is a practice leader for The Institute for Performance Improvement, and a Certified Performance Technologist. He is also a Fellow of the International Board of Standards for Training, Performance and Instruction. “Many organizations are currently investigating and implementing learning games”, said Bryan Austin, Game On! 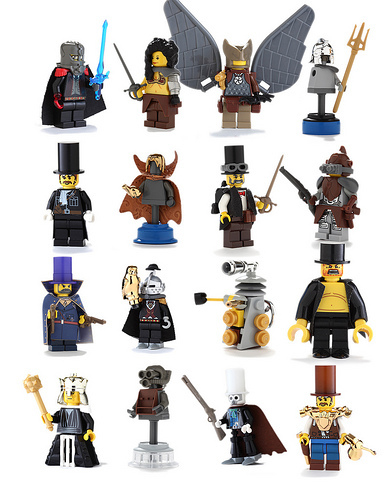 Learning’s chief game changer. “ Most are doing so to address the increasing lack of learner engagement of traditional elearning. What those implementing learning games are finding, though, is that they are not just engaging, but that well-designed learning games more effectively anchor knowledge and increase skill proficiency than their “traditional” classroom and elearning counterparts.” Many of corporate learners like games, and play them enthusiastically when at home. For corporate learning professionals, though, the interest is in serious games: those games that are designed to have learning outcomes relevant to the job. 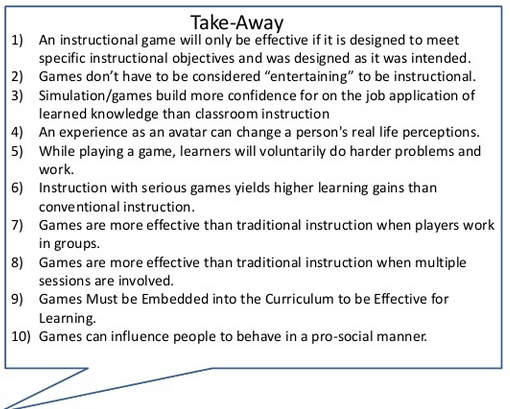 “What you really want to know is whether the game is effective in improving job skills, not game skills”, adds Austin. “Research on serious games suggests improved job skills can be a result of integrating a serious game into your training program. But the same research shows that effective serious games are difficult to design, and they are rare.” This research-based white paper provides key elements to look for in an effective serious game. This complementary white paper can be downloaded by clicking here. About Game On! Learning Game On! Learning provides inspired online game based learning solutions that create unmatched learner engagement and produce learners who will immediately and confidently apply their newly acquired skills on-the-job. Our revolutionary “serious games” feature a highly interactive, animated video game design, fun competition versus colleagues, learner-individualized feedback, and real world learning scenarios. An extraordinarily high degree of in-course skill practice helps ramp up employee performance, increase productivity, and move your organization more rapidly forward. We deliver lasting results in an unforgettable learning experience. It’s the most exciting thing happening in organizational learning today! We help you Get Your Game On! “By engaging students and pushing them to succeed, games may offers a new way to teach students, according to an expert on performance and gaming. In a presentation at least week’s “Educause” conference in California, Jane McGonigal – a game designer, author and researcher – predicted that “extreme learning environments” will offer students a chance to play and create while they learn. Tags: coursework as a game, Game design, Games and Learning, games-based learning, gamification, interactive fiction, text adventure.